As a result of a top 10 standards-based grading books list published not too long ago, a reader of this blog made me aware of The School Leader’s Guide to Grading by Ken O’Connor. So, I bought a used copy on Amazon and read it during a summer airplane trip, halfway across the country. I cannot believe I had not read this book until now and whole heartedly recommend it to all principals and central office administrators who are considering a standards-based grading shift. The preface states, “This book is intended to provide principals with ideas that will improve their effectiveness in helping and supporting their teachers in evaluating and communicating student achievement.” I believe this book does just that, in a concise and easy-to-read manner. 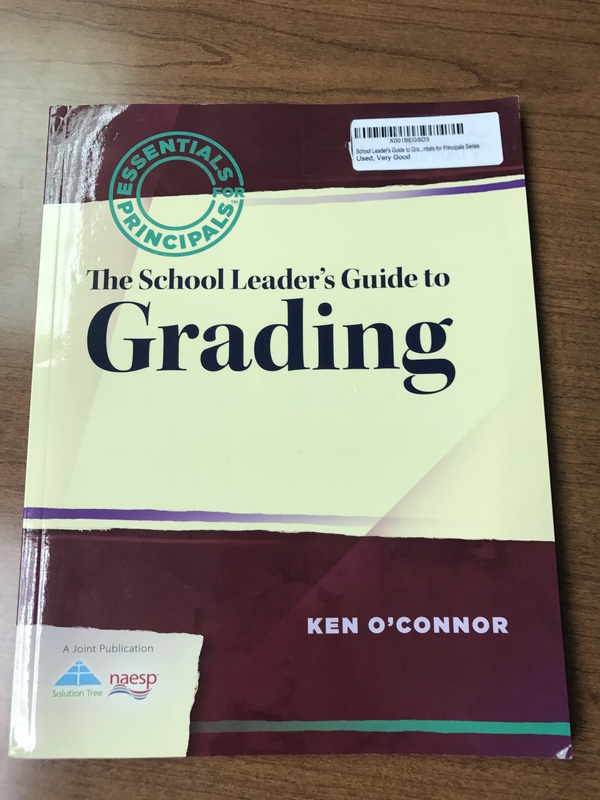 Although the title of the book does not refer explicitly to “standards-based grading,” author Ken O’Connor communicates four critical conditions for effective grades which are right in line with SBG principles. For example, one of the conditions states, “Grades must be meaningful” and the author further explains “Getting a B in history tells students and parents almost nothing….To be meaningful, grades need to be based upon standards, outcomes, or expectations” (p. 2). Perhaps the aspect of this book I appreciated the most was Ken O’Connor’s ability to articulate both theory and reality. While eliminating letter grades may be the gold standard, O’Connor realizes this may be beyond state, district, or local expectations, therefore he proposes practical ways to help principals keep the focus on learning. Another helpful component of the book is the examples from schools who are working towards each of the grading conditions. O’Connor is quick to note these are all examples and not models, which again illustrates the practical and humble approach the book takes in assisting principals with grading shifts. For example, the book suggest students should be provided multiple opportunities to demonstrate their learning. Often times, this will involve students completing “correctives” prior to reassessment. A sample “Assessment Retake Reflection” from a school in Wisconsin is provided for principals to use as a starting point in their conversations with individual teachers or an entire faculty. Finally, at less than 100 pages (including ~20 pages of appendices), I believe this book is an appropriate length for principals who are often busy managing the day-to-day operations of a building. If I were to lead a course for school leaders looking at standards-based grading, this would be my first choice.